The Box Hill Hawks are thrilled to announce the signing of Port Melbourne premiership star, Damian Mascitti, for the 2019 VFL season. The 26-year-old will bring a wealth of talent and expertise to City Oval, stemming from a football journey which began in the ranks of the Oakleigh Chargers, where Mascitti was crowned Best and Fairest in 2012. From there, the versatile utility crossed to Port Melbourne and to present day, now boasts seven years of VFL experience. A standout year with the Borough in 2016 saw the 190cm right-footer named in the VFL Team of the Year, an achievement he proved was by no chance, through repeating it in the following season. The individual accolade was then only topped when Port Melbourne triumphed over Richmond to take home the 2017 VFL Premiership, a feat which Mascitti cites as a career highlight. However, the year that followed didn’t quite go to plan. A frustrating stint on the sidelines, courtesy of a pre-season achilles issue proceeded by an unlucky finger injury, forced Mascitti to miss the opening four months of the 2018 season. The ultimate professional, Mascitti remained determined to stay positive and make an immediate impact upon his return, and through meticulous preparation did exactly that. 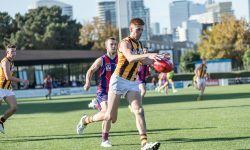 A promising comeback against Essendon in Round 18 was followed by a stellar patch of football which ultimately led to a finals berth for Port Melbourne – and what would come to be an elimination final for the ages – against Box Hill. Unfortunately for Mascitti, the memories aren’t quite as fond as they are for the brown and gold faithful. Mascitti’s individual performance was certainly no source of disappointment, as four goals and 26 disposals near single-handedly derailed Box Hill’s September campaign. Now, Mascitti can see the irony in donning the guernsey of the side that put an end to the dream of back to back flags – but after seven years at Port Melbourne, he viewed the Hawks as a fresh start. From afar, Mascitti maintained the utmost respect for Box Hill and the professional manner of the club, while equally enticing was the strong AFL alignment, which keeps alive Mascitti’s dream of reaching the highest level. Although playing the majority of his junior football as a forward, Mascitti has since plied his trade across the backline, making a name as an elite ball user with the ability to seamlessly blend defence and attack. And while bringing an abundance of skill on the field, his off-field leadership should also prove invaluable, particularly amongst the younger players. Mascitti will be doing exactly that, after having scarcely missed a game in years prior, he is driven by the disappointment of last season and will be taking each possible step to play every game come 2019. In terms of the end goal, it’s rather simple.